Although awareness of it has been in the consciousness of Charles Dickens fanatics for years, only now has the controversial affair between the author and Ellen “Nelly” Ternan been brought to national attention with the arrival of Ralph Fiennes’ sophomore film as director. 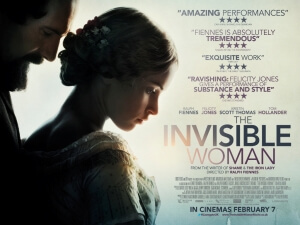 The Invisible Woman is a delicately handled costume drama about the individual lives of both parties, and offers a good representation of the time period through stunning costume and set design. Each set of clothes, designed by Oscar-winner (and nominee for this movie) Michael O’Connor, is beautifully crafted with matching formality to go with their pride. Fiennes has two areas of this film where his talents can be put to good use, and with both creates an inescapable, but successful, presence. Off-screen, he directs with quiet passion and restraint. During the film’s more intimate scenes, he has the camera go in as close to the performers as possible leaving us with no choice but to be caught between their sordidly private affairs. Though the immediacy of his directorial debut Coriolanus isn’t present, his eye for quiet, sometimes dialogue-free moments of passion make up for its absence. As Dickens on-screen, Fiennes captures the author’s lust for life as displayed in scenes of public affection, but also his much crueller personality traits which more than occasionally seep through. His public separation from wife Catherine (an extraordinary Joanna Scanlan, who delivers a truly heart-breaking portrayal of a neglected spouse) is announced to even her shock in the press, and it is near painful to see his cold, bitter face during a brief montage as though he doesn’t care about her well-being and considers himself free from supposed torment. Both on and off-screen, Fiennes makes his stamp on the story. Felicity Jones, however, is the bigger triumph as Nelly. Playing a young woman continuously tormented by her affair with Dickens, the Like Crazy actress creates a captivating emotional environment for her character to bounce off of, which works to devastatingly real results. A later few scenes which explore a heavily-rumoured theory of a miscarried child between the couple are testament to that. Though both leads are excellent in their own right, there is something that prevents them from gelling as an engaging romantic couple here. Perhaps it’s more to do with Abi Morgan’s otherwise-fine screenplay – already bogged down slightly with its off-balance storytelling and moments of heavy-handed dialogue – but the chemistry between them, while apparent, feels constrained and unable to express itself the way it wants to. It’s very possible their relationship really did feel this calculated, but none of us can know for certain and you’d be forgiven for desiring a little more liveliness with its portrayal. Then again, this is not meant to be a light-hearted tale but rather one of subtle tragedy, so there is at least reasoning for its near-humourless, darker tone. The film likes to take its time in showing the relationship between Dickens and Nelly which, though necessary because it is so long-winded, can be testing of the audience’s patience. We do not even see a clear act of passionate desire between them until just after the halfway mark, with the eventual act of consummation coming even later. When the affair is well and truly established, there is not enough time left to fully explore it and leaves most plot threads hanging by the closing credits. The irony of The Invisible Woman’s title is that it describes the wrong entity; it is the affair itself that sadly feels invisible. 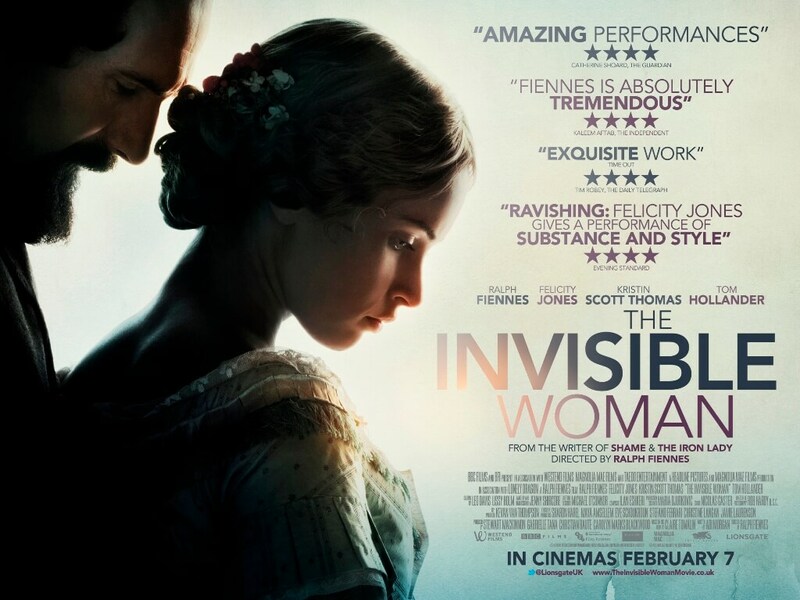 The Invisible Woman is a carefully-crafted period drama, with excellent performances by Ralph Fiennes and Felicity Jones, and firm direction by the former. However, slight scripting problems prevent the central affair from catching alight and its deliberate pacing gives it a sluggish feel that undermines the drama and makes it less engaging than it desires.